40% of UT students reported having back pain during the last school year. Back pain can result from an injury, but it can also be caused by poor posture or improper weight distribution like a heavy backpack. Wear your backpack correctly. Use both straps and limit weight. A loaded backpack should weigh less than 15% of your body weight. 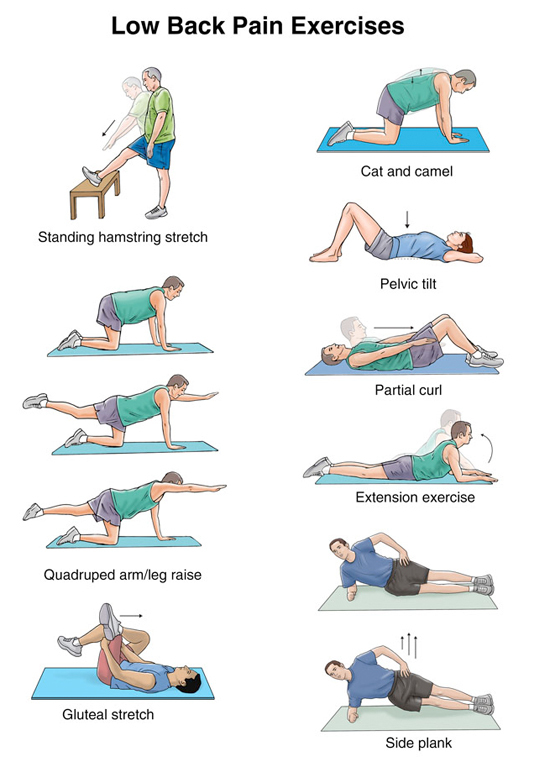 Exercise regularly, and stretch before you exercise. Balance: Create a wide base by balancing your body over your feet. Alignment: Keep your back straight. Contract: Contract your stomach and keep the weight of the object close to you body. Don't lift or move heavy objects over your head. Knees: Bend your knees, and use your legs-not your back-to lift. If you have tense muscles or recent minor injury, apply an ice pack several times a day for no more than 15 minutes at a time. Take a pain medication like acetaminophen, ibuprofen, or aspirin. Pain persists or impairs your usual daily activities. You experience any tingling, numbness, or reduced ability to move. Pain is accompanied by a fever.